Abelardo G. Fournier is a PhD candidate at Winchester School of Art. His practice-based research speculates with the notion of a digital colonization of the visual, both by machine vision systems and the industrial coating of visible surfaces. In this post he reviews “Inner Colonization”, the project developed during a 6-week residency in Matadero Center of Art in Madrid and the resulting exhibition with the rest of the selected artists from Spain, Korea and Japan. In a large old industrial slaughterhouse area transformed into a cultural center, last November I participated as an artist in residence in the program El Ranchito, supported by Matadero Center of Arts and AECID. There, eight artists and collectives from Spain, Korea and Japan, selected from an open call, shared studio space to elaborate our projects and to prepare a collective exhibition of the results. 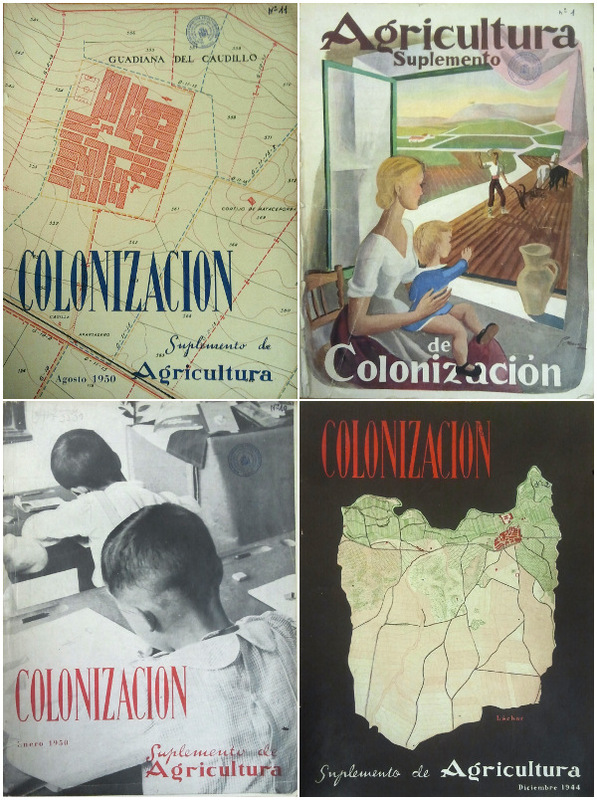 Inner Colonization, a project belonging to the practice-based research I’m elaborating at WSA, has dealt with the operations of the Spanish National Institute of Colonization during the 1939-1973 years as part of Franco’s dictatorship reforms. During three decades, this institution transformed enormous extensions of Spanish land in search of productivity, demographic growth as well as ideological control. Linked to the so-called “Green Revolution”, it involved the engineering of large-scale water infrastructures, big movements of population and a centralized management of the information gathered in the continuous monitoring of the process. This inner colonization, as it was called by the Administration, has been one of the most ambitious reforms in the recent economic history of Spain, and completely changed, as a result, the face of its rural landscape. 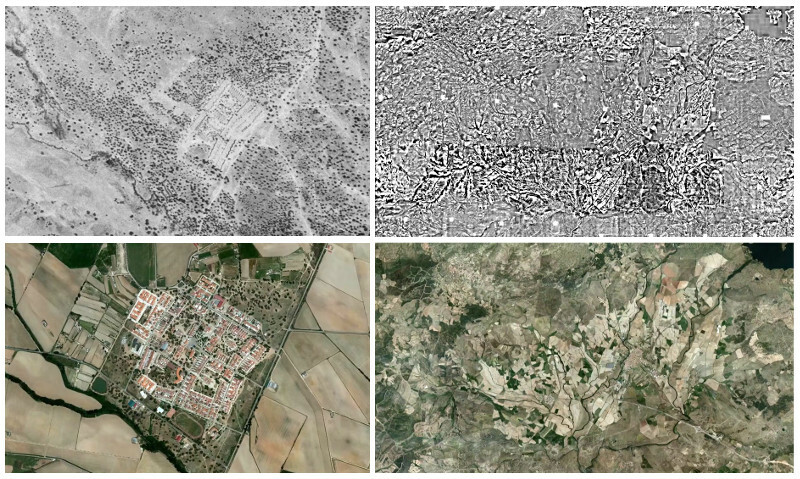 Interestingly, this technification, exploitation and population of large extensions of land coincided with the first series of aerial orthophotographic pictures mapping the whole Spanish territory. The same land that, on the one hand, was being measured and parceled, was on the other hand being photographed frame by frame by fleets of aircrafts. Although the resulting images where not used as widely as contemporary satellite ones nowadays, the aerial point of view pervaded the illustrated documents and the audiovisual films that publicised the reform. Seen from above, any of these transformed territories appears today as a huge green stain surrounded by wasteland: its industrial scale becomes visible, once the workers, their tools and homes have been made imperceptible. It is a vertical perspective, using Hito Steyerl words, complementary to the engineering of the soil, that completes the assimilation of land into the circuits of abstract economy. Aerial photography, 1956 and 2014. Left: Vegaviana, a settlers’ town founded in 1955; right: colonization at the Borbollón dam (software reconstruction). Source of the image tiles: Spanish National Geographic Institute (IGN). During the residency in El Ranchito, I’ve proposed a speculative parallelism between the actions of the Institute of Colonization and the transformations operated by the digital industries nowadays. Under the gaze of machine vision systems, land was populated by settlers with a “Terms of Service” type of contract and tightly controlled by State officials, just as social media networks are, today, populated by TOS regulated users and monitored by corporate databases. As two processes that have transformed the ways we relate to the surfaces of the world, the project has emphasized in particular the extractive relation with the terrain itself they also share: the soil, its variability and its becoming something to be pictured and measured in order to be capitalized. To do this, I have developed a set of specific measuring devices designed to approach those terrains as media to be read or, more accurately, decoded. 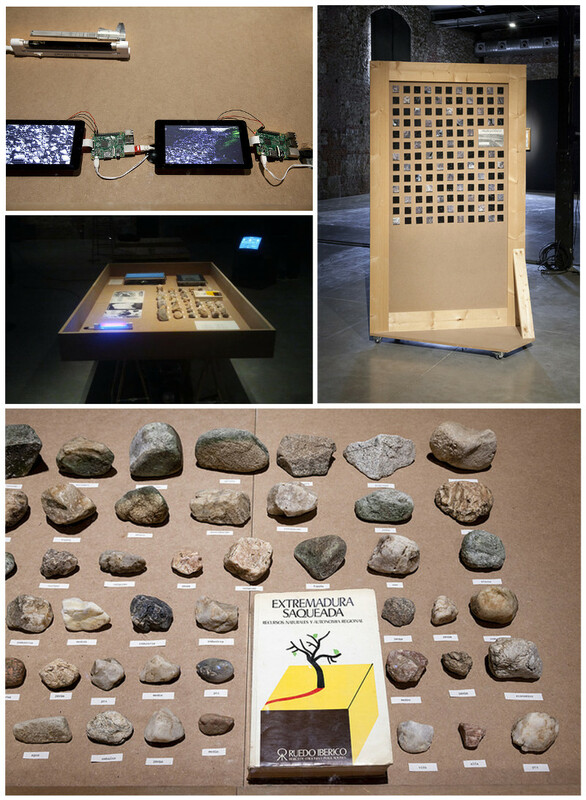 Lengths, frequencies and computer vision techniques, together with a deciphering algorithm, have been put together to playfully establish a relation between stones and words, between any particular terrain and any chosen book. “But it is not an alphabet, it is a pattern without a message” (Caillois, 1985, p.70). 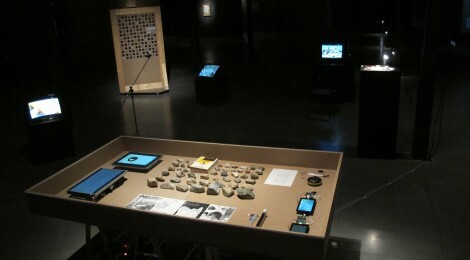 A sequence of selected pages of Roger Caillois’ book The Writing of Stones is shown in a screen inside a display cabinet table, together with the measuring instruments, the stones and other documents and videos. The cabinet is surrounded by other displays -several screen monitors, a vertical panel and a plinth- containing other pieces that have been elaborated for the project. 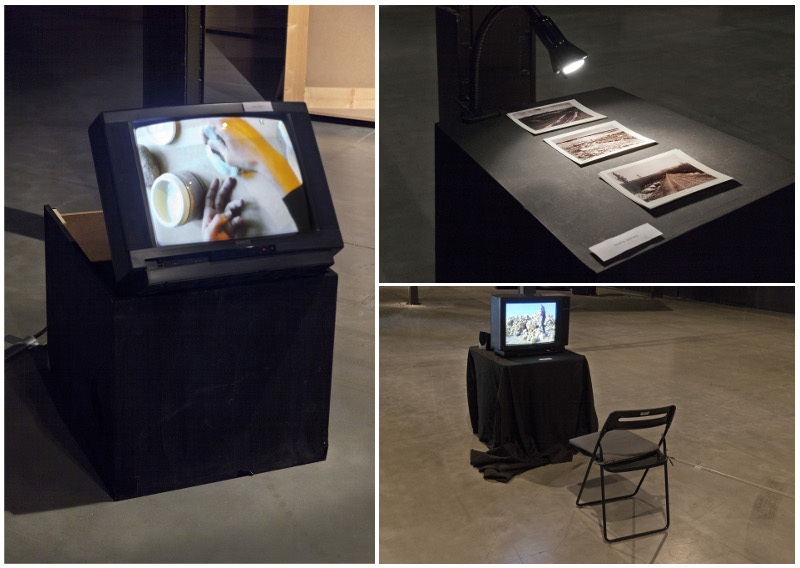 In the exhibition space, the installation unfolds as a still lab, an aggregation of pieces and fragments documenting a process of research and conversation. Three of them, additionally, have been elaborated by three different artists invited to contribute with a specific work: José Otero, Sandra Santana and María Andueza. The nature of the actions of the Institute, its archives together with the nuances of the name given by the Government to the process, inner colonization, suggested and stimulated a collective approach, open to a variety of voices and actions. The exhibition was open to the public in Matadero until the 10th of January. It also included work produced by Gun-hee Kim and Part-Time Suite from Korea; Nobuaki Itoh and Maiko Jinushi from Japan; and Helena Grande, Jonathan Notario and Alejandra Pombo from Spain. Top image courtesy of José Otero. Roger Caillois (1985) The Writing of Stones. University Press of Virginia.